There are many products that function in a similar way to SUPER ZOIL in the market around the globe. What differentiates SUPER ZOIL from any other additives is its unique technology that introduces a completely different and innovative approach to motor engines. Since engine consists of metal parts, metal frictions cannot be avoided. This friction damage will cause uneven engine surfaces, resulting in energy loss. 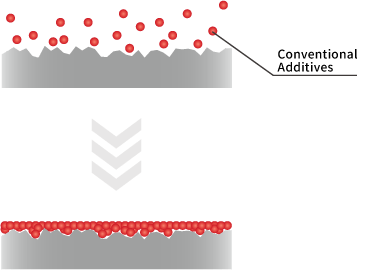 When a conventional oil additive is applied, it only penetrates into worn-out sections of the damaged surface. This is generally called the "coating agent", in which the additives are drained out of the system when the oil is changed. This results in the constant need of replenishment. 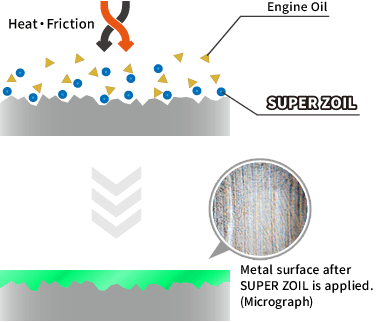 When SUPER ZOIL is applied, the metal surfaces become extremely smooth due to a special chemical reaction that is triggered by heat and friction, creating optimal conditions for oil lubrication. This treatment effect is the key technology of SUPER ZOIL. The effect of SUPER ZOIL becomes evident after travelling only a few kilometers. Unlike the conventional coating agent, SUPER ZOIL does not need to be added at every oil change, since its effect is semi-permanent. 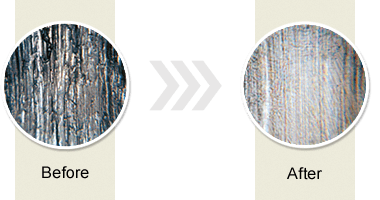 Please compare these metal surfaces before and after SUPER ZOIL is used. The uneven metal surface is improved, creating a smooth surface.